Faith is a great leveller. Every year, shrugging aside divisions of religion, caste, class and gender, thousands of people from all over Maharashtra undertake a 20 day-long journey on foot to Lord Vithoba's temple in Maharashtra's famed pilgrim town, Pandharpur. 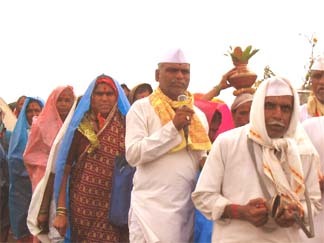 These pilgrims, called 'warkaris', accompany a procession of palanquins (palkhi) of nearly 50 saints from Maharashtra - the Bhakti movement saints, Dnyaneshwar and Tukaram, being two of the most prominent. The procession starts from Dehu, near Pune, in the Hindu calendar month of Jyeshth (roughly, June) and lasts a total of 22 days. On the eleventh day of Ashaad (usually some time in July), the procession reaches its destination in Pandharpur. It is estimated that the ritual began in the late 1600s. Although there are not many written records of the tradition, historians credit Narayan Maharaj, Sant (saint) Tukaram's youngest son, with pioneering the tradition in 1685. After the death of Tukaram - who visited Pandharpur every year with a group of 1,400 warkaris - his brother Kanhoba and son continued the annual pilgrimage (wari). They carried the saint's 'padukas' (wooden slippers) on a palkhi to symbolise the saint's presence. Folklore goes that Narayan Maharaj proceeded with Tukaram's palkhi from Dehu to Alandi, where he placed Sant Dnyaneshwar's padukas in the same palanquin and proceeded to Pandharpur. That marked the beginning of these palkhis, which now number about 50, representing various saints, including Eknath, Namdev and Chokha Mela - all prominent saints in Maharashtra. Once the Tukaram and Dnyaneshwar palkhis set off, the other palanquins also begin their journey. An important feature of these saints' writings is their non-elitist character. Written in colloquial Marathi, their works are accessible to all sections of society. The Bhakti movement in Maharashtra, of which these saints were a part, is known for its progressive character. The saints themselves, in fact, belonged to different castes - the Brahmin Dnyaneshwar; the grocer Tukaram; the gardener Sawata; and the potter Gora Kumbhar are examples. The journey, though, is not just a means to obtain a glimpse of Lord Vithal at Pandharpur; it carries significance as a spiritual discipline. Over the centuries, most saints - Dnyaneshwar and Tukaram included - have followed the tradition of wari. True to the pilgrimage's spirit of communal harmony, the Tukaram palkhi first stops at the mausoleum of a Sufi mystic, Baba Angadshah, in Dehu. Interestingly, two Hindu families have been tending the dargah faithfully for three generations. The procession itself is steeped in symbolism. The family that plays the traditional drum to lead the procession at Dehu is Muslim. In the early 1900s, impressed by the devotion of the temple caretaker, Abdul Mulani, the then manager, Babasaheb Inamdar, had asked Mulani to play the drum on all important occasions. The seeds of a tradition had been sowed. In an interview, Mulani's grandson Syed Ibrahim Mulani said that his father's last words were, "Whatever you do, son, do not stop playing the drum at the temple." Syed Mulani has kept the tradition alive and has ensured it won't die with him. His youngest son Riaz now plays the drum. Inclusion, in fact, is the very spirit of this pilgrimage. In Pune, for instance, where the palanquins halt for two days, people from all communities unite in their hospitality towards the warkaris. Sherna Minawala, 36, and her Parsi neighbours have been providing food and snacks to warkaris for over a decade now. "There is so much devotion and camaraderie. Everyone cares about each other and, more importantly, respect each other," says Minawala, who works in a private company and takes a day off when the palkhi arrives in Pune. In one of the city's byzantine lanes in Nana Peth, Saleem Mian, a professional masseur, sets aside two days every year, when he massages the weary warkaris' feet for free. "I am overwhelmed by the devotion of warkaris and this is my humble offering to the pilgrimage," says the sexagenarian. A few lanes away, Abu Mohammed is ready for the journey. He has been going to Pandharpur for five years now. What drew him to the procession was its spirit. "Everyone is welcome and everyone is equal. There is no distinction of caste, class or religion. It is a celebration of oneness," says this devout Muslim. Smita Abhyankar takes leave from her travel agency job for a fortnight every year to participate in the pilgrimage. She says there have always been Muslim pilgrims in her group of warkaris. She speaks of Jaitundi, a Muslim woman whose scholarship of Dnyaneshwar's works and recitation of his bhajans is well-known among the warkaris. Jaitundi has been a warkari for the past five years. Although the pilgrims are organised into neighbourhood groups, they freely welcome non-members into their procession. Women participate in large numbers; many coming alone. For over a fortnight, they free themselves from domestic chores and societal roles. Kalavati Mhaske, a pilgrim, says, "Our relatives or neighbours take care of our children. They know we are not going for 'mauj masti' (fun)." Incidentally, fables abound of how husbands who did not let their wives go with the procession were "taught a lesson by Lord Vithal". The warkaris' long and disciplined procession is a remarkable sight. They hold aloft saffron flags, sing devotional songs and dance to the tune of traditional instruments like the 'lezim' and 'taal'. Come rain or shine, 50 palkhis of saints - accompanied by over three lakh people - assemble at Vakhari near Pandharpur every year, before proceeding towards the temple town. The devotion and harmony that characterises the pilgrimage has drawn many atheists as well. Noted Marathi writer P L Deshpande, himself a non-believer, says, "Touching the tired feet of a warkari is more devotional than touching the feet of Lord Vithoba." This procession of palkhis to Pandharpur is more than just a pilgrimage; it represents a tradition that unites diverse people. It is wrong to describe Tukaram maharaj as grocer. For a saint, though caste is meaningless, he belonged to KUNBI (Maratha).